The call came in the early evening. Something was wrong with the big television in my son’s room. What do I know about TVs? Not much—I’m a book designer, after all—but I went in to have a look anyway. It showed a dot when turned on, but was otherwise black. Of course, it was out of warranty. What do you do then? The big flat-screen just sat on the wall, as good as dead. Are there “flat-screen repairmen”? I didn’t know. And the problem is that prices keep coming down as these TVs get bigger and bigger. It looked like it might cost more to repair the TV than it would to replace it with a new one, and the manufacturers knew that. But this was no time to be making a big purchase. Now there might have been a time you could go talk to the local electronics guy, or buy a magazine about it, or go to the library or a bookstore to see if you could find some information that would help. Today we just google. That’s how I found a bunch of videos about our little Samsung problem on Youtube.com. Eventually I stumbled on an amateur video by a woman with no electronics training, showing exactly how she repaired her own Samsung with the same problem. A trip to the store bought me a couple of capacitors for $3, and a soldering iron (something I hadn’t seen since 9th grade) for $9. Following the steps in the video, we slowly and carefully repaired the television, plugged it back in and—miraculously—it worked! I can’t think of another way this would have happened if I hadn’t found those videos and followed along with them. In this case video was clearly the best way to communicate the information I needed. That’s good to know, especially for authors of nonfiction or instructional books. But there’s more. My favorite way of getting instruction from training courses is through audio. I dump all my podcasts, lessons, lectures or other audio files to my iPhone and listen to them in the car, at the gym, spaces that are otherwise unused. The readers who speak out about their preferences are really valuable, because I know that many people won’t say a thing. But they may stop reading or feel vaguely unsatisfied because they aren’t getting the information in the format they like it in. That’s why self-publishers need to know the expectations of their readers. And in the case of consultants or content providers, where their income is connected to their content, this is even more important. As authors, our main products are books, but the reality of content marketing today demands that we expand our offerings to match the needs of our readers. The days of big, hierarchical media broadcasters dictating how and what we’ll get are fading. That’s part of the reason self-publishing is growing so quickly. And in this new, more connected age, nonfiction authors are finding out that the principles of marketing suggest that they actually engage with their audience rather than toss them gifts from afar. In transcribed text in downloadable PDFs. It’s also why you’ll find videos in various style, from live action to screencasts to mind maps to convey information, depending on what’s more appropriate. The ability to mold our content into these different forms is truly amazing. Some of the tools I’m using were invented within the past year, and simply didn’t exist before that. And I need all the help I can get because otherwise, for a paper-and-ink guy like me, providing all these formats would be impossible. 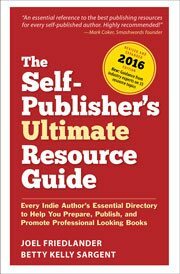 Matching your content to its intended use and taking into account the way it will be distributed to the eventual users is the same challenge self-publishers face when they try to come up with a publishing strategy for their books. I’ll be using the immediacy of video to present a series of videos that walk you through some of the key steps in self-publishing, as well as pointing out some of the obstacles you find in your way and how you can overcome them. Whether or not you think the course is for you, I hope you’ll take the time to check these videos out. If that seems interesting to you, and if you’d like information on how to join an amazing group of people as we go through the publishing process together, it’s easy. Just put your name on my early notification list and I’ll let you know as soon as we’re ready to go. The expansion and crossover of media is an interesting development, Joel. I see it as a plus for the blind because a writer who writes for audio, for instance, needs to clearly describe what he is indicating [graphs, diagrams, flow charts, etcetera]. This is something writers of conventional books and manuals have overlooked in the past and it makes accessing information or instructions nearly impossible for the blind. I consider anything that can level the playing fields to be a positive move! Thanks so much for your helpful comment, Leanne. Providing this kind of information is something most writers—including me—don’t usually think about. You could perform a valuable service by publishing guidelines or best practices for authors who want to heed your message. In my line of work, I end up working in a variety of media, from print to photos to audio to video. There are some niceties with video that authors should be aware of in choosing where to put what. For instance, YouTube versus Vimeo . . .
Is your video for commercial purposes, or is it for all comers without any expectation of deriving financial reward, or is it something that you anticipate income from? Which options give you greater levels of control over the video, and which make it easier to apply your own branding if you want to? Which provides a better overall experience for your viewer? Which imposes time or file size limits as opposed to allowing you to present a longer video seamlessly? There’s a lot to consider, but far fewer barriers to entry than if you work through established video development and distribution businesses. With today’s merging of high-definition video and still photography in the same camera, the tools for quality production are more affordable and available than ever. The idea of audio pieces to accompany an ebook is great and something every self-published author can do. Something I was taught as an intern for Neill Corp. was (in a nutshell) how each student will learn & receive information differently. A lot of people perceive things by seeing an image or hearing it spoken, and NOT by reading- which is why you can’t stand in front of a classroom and read from the textbook and expect it to stick. They say variety is the spice of life! Variety is also the key to getting your point across. Not just in written words, but visual and audio too. Great post. As always, I enjoyed reading. I had a similar epiphany this past week. I was knitting a skirt and having some trouble understanding the instructions. I consulted two reference books but still didn’t “get” it. I went to YouTube and found precise, visual instructions that helped me get beyond my confusion. I’ve seen the occasional YouTube video in the past, but suddenly I’m a convert! Exactly – we all ‘learn’ in different ways – visual, auditory and kinesthetic/tactile (by doing) ; it’s wonderful that as authors we now all have the means at our direct disposal to market our books using the first two… I have to confess that I’ve not yet gotten around to creating anything in video or audio but it’s very much on my to do list – especially a short YouTube extract of reading from an early chapter of one of my children’s books…. I agree too, that a variety is good. It always takes me back to school, how they say some people learn through listening, others though doing, and some by watching.